This complete AR500 Gong Kit is the perfect gift for the shooter in your life! (Or for you, you know you deserve it!) This kit comes with everything you will need for a day of long range shooting at the range. - Boar shaped steel gong target. - 2 self-healing polymer brackets. - 2 self healing gong holders for gong. - Hardware to hang gong. - Six 4' pieces of rebar. Hanging a piece of steel down range isn&apos;t new, but it has never been more affordable or better quality. Action Target is proud to offer more than 30 new target shapes and thicknesses to hang from any chain, rope or the innovative The Last Stand target hanging system. Precision shooters will enjoy circles from 4-18 inches. IDPA and IPSC Torsos for training and sportsmen will love shooting our life-size animal shapes including: Boar, Coyote and Prairie Dog. 1/4-inch, 3/8-inch and 1/2-inch are available. 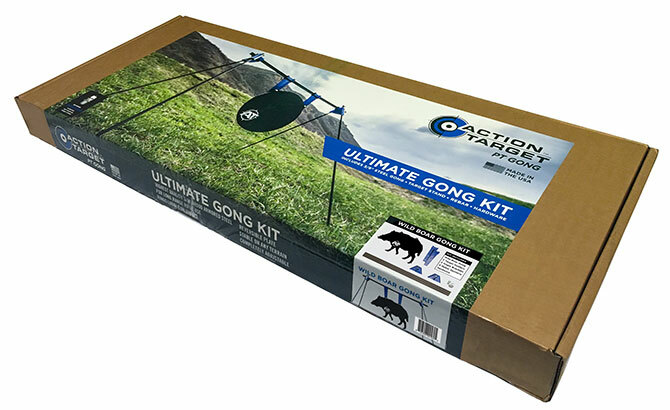 The patent pending Last Stand system is the most portable and longest lasting gong stand available. The leg brackets and target holders are both made of a self-healing polymer that can handle hundreds of rounds before replacement. Compare that to ropes and chains that can break in one shot. The leg brackets make adjusting each leg height fast and easy to provide stability on any terrain.